A few weeks ago, I was asked about the products that I use for a flawless look. To answer this question, it only made sense for me to start at the foundation of my makeup routine. I believe, healthy skin is the basis for my flawless makeup application. 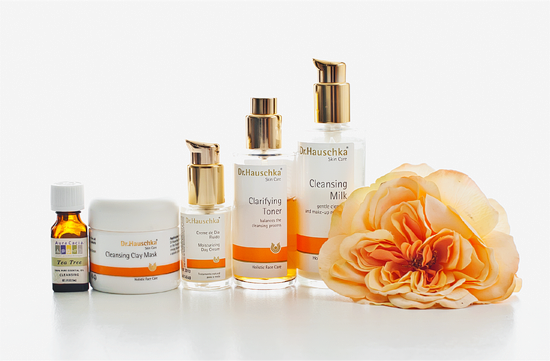 Cleansing: I wash daily with Dr. Hauschka’s Cleansing Milk. It’s a gentle cleanser for my sensitive skin, and works as a make-up remover as well. Toning: After using the cleansing milk, I then spritz Dr. Hauschka’s Clarifying Toner on my skin to balance the cleansing process. Moisturizer: Then I apply Dr. Hauschka’s Moisturizing Day Cream on my skin. I use this product day and night. If I have a blemish: I spot treat it with Aura Cacia’s 100% Pure Essential TEA TREE Oil. This oil has antibacterial, antimicrobial, antiseptic, and antiviral healing properties great for blemishes. Mask: I use Dr. Hauschka’s Cleansing Clay Mask to exfoliate and as a deep purifying cleanser weekly. It's all about finding products that are good for your skin and will work for you. For me, a good skincare routine is what creates the most flawless makeup application. What is your skincare routine? Leave me a comment below, I’d love to know the products that you use!